The year 2000 will be a noteworthy occasion, as we will commemorate the 50th anniversary of the Korean War. To observe the anniversary, ROK Government is planning a variety of events to honor the Allied Forces war veterans in all over the world as well as from Korea and to express the sincere respect and appreciation of the Korean people to the surviving veterans or their family members. An additional goal of the commemoration is to promote friendship and goodwill among our allies, who generously demonstrated their commitment to world peace and freedom by sending their troops to Korea 50 years ago. 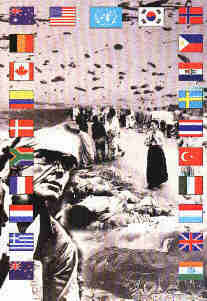 The commemoration will run from June 25, 2000 to July 27, 2003 - the 50th anniversaries of the outbreak of the war and the signing of the Armistice Agreement ending the conflict. Fifty two commemorative events, including the 50th Anniversary Commemorative Ceremony, will be held in conjunction with various domestic and foreign commemorative functions. These events will pay homage to the memory of those who made the supreme sacrifice in the Korean War under the United Nations flag, and express a profond sense of gratitude to all foreign veterans for their friendship. We will wholeheartedly welcome the war veterans to Korea so that they may share the special memories and affection of Korea with each other and the Korean people, who are deeply appreciative. In an effort to express its sincere appreciation, Korean government is doing its best to make their trip to Korea pleasant and memorable by providing various assitance and services. To commemorate the 50th anniversary of the Korean War in 2000, we are preparing a variety of events. The purpose of the commemorative program is to honor the war veterans from allied countries as well as Korea and to express the deep respect and gratitude of the Korean people to them and their family members. At the same time, the events are planed to intensify the patriotism of the generation of Koreans who were born after the war and to rekindle the nation's vigilance to its national security. The programs will play an important role in strengthening the existing friendship among those countries that fought for world peace and freedom during the Korean War. 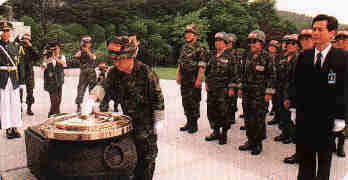 To hihglight the true sense of the Korean War, the program will commence on June 25, 2000, fifty years after the day when the war started 50 years ago, and last through July 27, 2003, the fiftieth anniversary of the day when the war came to an end with the signing of the Armistice Agreement. There will be 52 programs under eight categories. 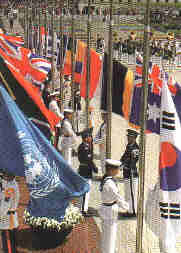 The programs will be implemented nationwide and, at the same time, on an international level.The programs are designed to promote the unity and harmony of Korean people, and to enhance Korea's national status in the world community, thus contributing to the world peace and prosperity in the 21st century. We will work continuously to develop the Korean War monuments and battlefields to make them as the most significant and appealing tourist sites for foreigners as well as Koreans. The ceremony will be held as an international program where representatives of allied countries participated in the war and the war veterans will be invited. The commemorative event will include a visit to the National Cemetery, a memorial ceremony, a parade and other entertaining events. Ribbon cutting ceremony at the monument to mark the visit of world leaders and declaration of Peace. The Korean War is a war that South Koreans fought to defend their country from the North Korean invasion ion a joint effort withthe UN Forces. The war signified the commitment of freedom fighters to defend peace and democraty of the world, and to contain the expansion of communism. The War Memorial, Domestic and foreign tourists - 2000. 6. 25. - 2000. 9. 30.